The Flying Guitar Ensemble is a collection of pieces of music together designed for groups of guitars (from the trio orchestra). The volume includes the score and separate parts of 8 original titles inspired by World Music: Balkanica (Albania), Pinocchiata (Italy), minimal Hindu (India), Montmartre (France), Air Dance Celtic (Scotland), Twilight Andalusian (Spain ), New Orleans Swing (USA), Mambotambo (Cuba). Designed for children attending the second year of study, they are ideal for beginners of all ages. Writings 3 and 4 parts, the tracks can also be performed with the addition of bass and possibly small percussion. To enlarge the extension to create great sound without reading problems and to avoid excessive ledger lines, in separate parts of some tracks was performed transposition of tone with the use of the nut. There are also numerous percussive effects on different parts of the guitar and the strings. The Flying Guitar Ensemble continues the didactic method of Vito Nicola Flying Guitar Heaven, and is the new essential support for anyone who wants to try and have fun with the music together. Suggestions from Celtic to Caribbean rhythms, atmospheres rich Spanish to the swing of Louisiana. 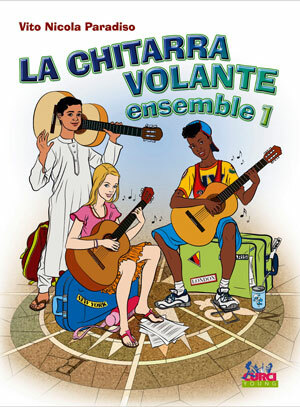 1 Ensemble transforms the music together on an exciting journey around the world!